A CT scan of a normal femur (top and bottom left) compared to one without VEGF (top and bottom right). Bone thickness and density is significantly reduced. Image courtesy of Olsen lab. 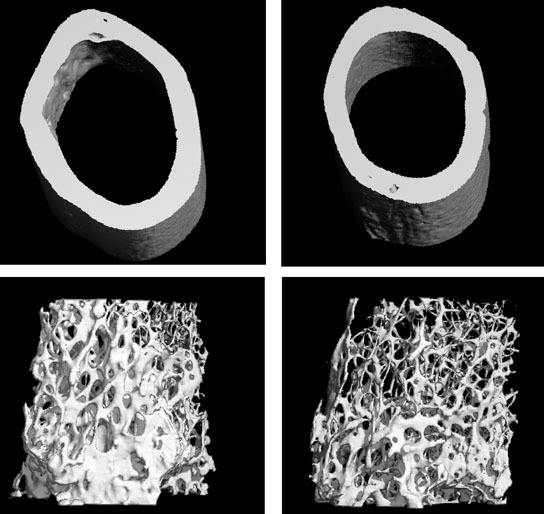 In what may lead to better treatments for osteoporosis, Harvard researchers discovered a new role for vascular endothelial growth factor (VEGF), a common signaling protein vital to blood vessel formation in early bone development and skeletal maintenance in mammals. Researchers have discovered a new role for a well-known signaling protein that regulates how bone marrow stem cells turn into either bone or fat. The discovery could potentially lead to new treatments for osteoporosis. “It shifts the thinking about what controls the differentiation of stem cells to bone cells instead of fat cells, and how to make sure this mechanism stays active with aging,” said Bjorn Olsen, Hersey Professor of Cell Biology at HMS and professor of developmental biology and dean for research at Harvard School of Dental Medicine. The finding was published online in The Journal of Clinical Investigation. Osteoporosis, a common bone disease characterized by thinning of bone tissue, affects one in five American women over the age of 50. In healthy individuals, bone is continuously formed and reabsorbed by the body. This balance is upset in osteoporotic patients. In their systems, stem cells that normally differentiate into bone-forming cells seem to become fat cells instead over time. To study this process, Olsen, the senior investigator on the paper, and his team of two postdoctoral researchers, Agnes Berendsen and Yanqiu Liu, and collaborators, focused on the role of vascular endothelial growth factor, or VEGF, a common signaling protein vital to blood vessel formation in early bone development and skeletal maintenance in mammals. The researchers developed a genetically modified mouse that lacked the ability to produce VEGF in bone marrow stem cells. They found that these mice developed an osteoporosis-like skeleton after birth, including reduced bone tissue and a build-up of fat in the bone. Stem cells isolated from these mice in culture were more likely to differentiate into fat cells rather than bone-forming cells. Using a technique called RNA interference, the researchers switched off VEGF in the stem cells of wild-type mice. This produced the same result, verifying the importance of the protein for normal differentiation of stem cells to bone-forming cells. Since VEGF is typically a secreted protein that works by activating receptors on the surface of cells, the team introduced extra VEGF protein to the cell cultures in an attempt to restore normal differentiation. They found no effect. However, when they introduced a virus containing a coding segment of VEGF, the stem cells began producing the protein and differentiated into bone-forming cells at rates typical of normal cells. This and other data provided strong evidence that the ability of bone marrow stem cells to differentiate into bone-forming cells relies on intracellular VEGF function, the researchers concluded. This unexpected finding was verified through additional biochemical and control experiments. The team also determined that VEGF regulates key molecules that affect bone formation and fat cell differentiation, as well as a nuclear protein that has been associated with premature aging. The researchers now plan on further characterizing the pathways involved with VEGF signaling in bone marrow stem cells and on discovering potential drug targets. This work was funded by NIH grants AR36819, AR36820, and AR48564 and partially supported by a Harvard School of Dental Medicine Dean’s Scholarship. Be the first to comment on "Researching the Link between VEGF, Stem Cells and Osteoporosis"